Through an educational booth, London Durant, Stephen F. Austin State University online elementary education student from Weatherford, teaches fourth- and fifth-grade students at Thomas J. Rusk Elementary School how to solve multistep problems with known and unknown variables. Durant was one of approximately 75 SFA education students who led the fourth Mathematics Career Carnival to teach students mathematics skills through career-related activities. NACOGDOCHES, Texas - What do zookeepers, veterinarians, pilots, florists and pharmacists have in common? Mathematics. Recently, Stephen F. Austin State University students from the James I. Perkins College of Education proved mathematics could be fun through their fourth Mathematics Career Carnival held at Thomas J. Rusk Elementary School. Through this interactive event, SFA students used 27 educational booths to teach fourth- and fifth-grade students mathematics skills with career-related games. SFA students created their booths and built lesson plans that met the Texas Essential Knowledge and Skills mathematics standards. "The critical component of planning these activities is ensuring SFA education students make realistic connections between the mathematics standards and careers that can be implemented in a short activity that is fun and engaging," said Dr. Paula Griffin, assistant professor of elementary education at SFA. "We want elementary students to have the opportunity to actively practice mathematics skills while making authentic connections to the real world." 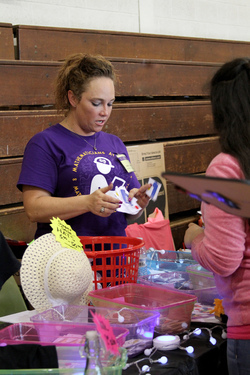 London Durant, SFA online student studying elementary education from Weatherford, set up a market where students were challenged as personal shoppers and cashiers to purchase and sell three items with a set dollar amount. This activity represented a multistep problem with known and unknown variables. "There are many different ways to apply the same thing. Finding something kids can interact with can be challenging, but you can make lessons very real-world oriented," Durant said. Other games included using algebraic reasoning as a set designer and florist, utilizing the mathematical process with rational numbers and decimals as a travel agent, working with fractions and division as a zookeeper feeding animals, identifying locations on a coordinate plane as a pilot and more. These booths were learning experiences for the elementary students as well as the SFA students. "The main thing our teacher candidates learn is how to plan something, implement it and adapt it," Griffin said. "That's something our students usually don't get to practice until they are the only one in the classroom. Even during student teaching, they have that safety net. During the carnival, they can't ask us for help; they have to do it themselves." For the first time, SFA students enrolled in face-to-face elementary education courses and secondary education students worked with the online teacher candidates to bring the carnival to life. Secondary education students are required to participate in an elementary education experience, so many worked as supervisors during the career carnival. Gareth Phipps, Crandall sophomore studying theatre and secondary education, said working the event gave him a different perspective on teaching. "It was very eye opening and interesting watching the elementary education students talk to kids and see the kind of conversationalists they are," Phipps said. "It was helpful to see how they pull answers out of students." Griffin worked with assistant professors Dr. Mark Montgomery, elementary education, and Dr. Chrissy Cross, secondary education and educational leadership, on this event. Griffin said 100 percent of the online students enrolled participated in the carnival, and in total, there were approximately 75 SFA education students involved in the event. Griffin and Montgomery plan to continue offering the Mathematics Career Carnival to other elementary schools in the Nacogdoches Independent School District and those in surrounding areas. For more information on SFA's education programs, visit sfasu.edu/academics/colleges/education.